Keep your room during the days of Hajj at Mena, Hajj Building only 15 minutes walk from Jamarat. 5 Nights in Hajj North American Camps (Mena – Arafat) air-conditioned. Open buffet breakfast and dinner served in bothMakkah, Madinah Accommodation. Breakfast and dinner served in Mena, and Arafat by the Saudi Government “Mutawif”. 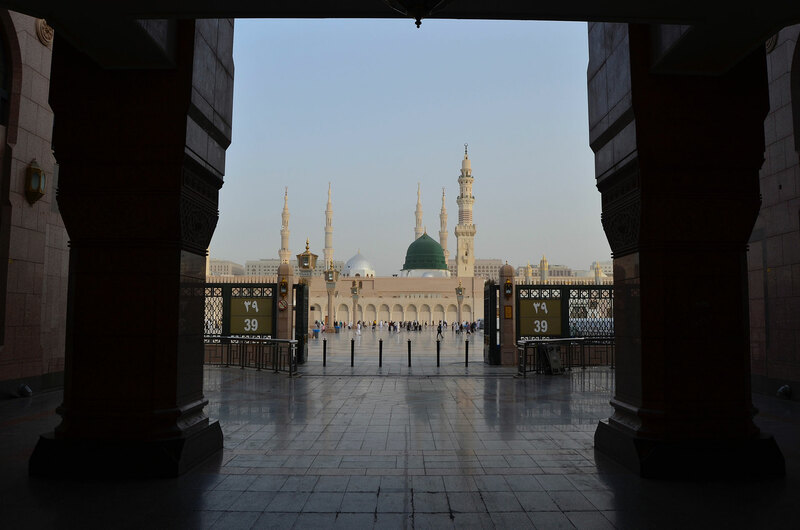 Private air-conditioned buses for transfers between cities and sightseeing tour in Madinah. Religious guidance provided by leading experienced scholars in English, Arabic & Urdu. Complimentary Hajj kit from Travel Guide. DISCLAIMER: The following is a tentative schedule summary that could change as the trip progresses. If changes occur, Travel Guide staff will advise you accordingly. Disclaimer: The information in this itinerary is provided as guidance to assist you during your Hajj trip. There are many variables in the Hajj which may cause adjustments and/or changes to this schedule and which may be made either by Travel Guide as it deems necessary or due to current Hajj regulations as issued by the relevant authorities. Please note that Travel Guide shall not be liable for any errors or misprint in this document. Gateway from Canada, Date and Flight information: Please refer to your e-tickets. Please take 2-3 photocopies of your passport /PR Card and Hajj Visa. Please be at the airport 4-5 hours prior to departure time. If you are taking a domestic flight connecting with the international flight to Saudi Arabia, we advise that your check‐in your luggage the entire way to Saudi Arabia during domestic flight check‐in. Representatives will direct you to the appropriate bus. After boarding the air-conditioned government buses, you will be taken to Madinah where you will check-in at the Dallah Taiba. Please remember that the first transportation in Saudi is provided by the government (this is mandatory). Upon arrival Travel Guide staff will give you your room keys. Please be patient, this may take time as there will be many other Hajji’s the hotel must attend to. Once you receive your room keys it’s recommended that you have a rest and freshen up before saying Salaam to Prophet Muhammad (PBUH). We will let you know when to regroup in the lobby. You will then continue to perform your Salaam for the first time. Sisters:Please make sure you have your Isdaal (Travel Guide Abaya) with you and not packed in your luggage that will be transferred. You will need to wear it for Umrah and Hajj. Brothers:Please make sure you have your Ihram with you and not packed in your luggage that will be transferred. Upon arrival Travel Guide staff will give you your room keys. Please be patient, this may take time as there will be many Hajji’s the hotel must attend to. Once you receive your room keys it’s recommended that you quickly freshen up before Umrah. We will let you know when to regroup in the lobby. You will then continue to perform your Umrah with the group. IMPORTANT! Please meet in the lobby at 10:00 am (timing will be confirmed by your group leader) with your Travel Guide Hajj backpack only. Do not bring excess baggage as space is extremely limited in the camps. IMPORTANT! Movement in Hajj from Mena to Arafat to Muzdalifah and back to Mena will be provided via Bus. Note:Upon check-in, you will be informed of the timings/location of the restaurant at the hotel where you will have your meals. Welcome to the TRAVEL GUIDE website (the “Website”). This Website is provided solely to assist customers in gathering travel information, determining the availability of travel-related goods and services, making legitimate reservations, and for no other purposes. The terms “we”, “us”, “our” and “TRAVEL GUIDE INC refer to TRAVEL GUIDE, an Ontario corporation, its subsidiaries and affiliates. The term “you” refers to the customer visiting the Website and/or booking a reservation through us on this Website, or through our branches, or through our customer service agents. TRAVEL GUIDE is a private company. TRAVEL GUIDE is not associated with any Canadian or foreign government offices or embassies. TRAVEL GUIDE is not responsible for the granting or denying of documents. TRAVEL GUIDE acts only as agents for the travelers in making arrangements for services provided by third parties, such as airlines, hotels, buses or other transportation suppliers in connection with TRAVEL GUIDE’s travel packages (hereinafter “Service Providers”). Our Website displays information about travel locations, airfares, travel agents’ locations, flight times and dates, tours, packages, insurance, cruises, transportation, foreign currency, schedules, travel companies and many other things. Although TRAVEL GUIDE uses best efforts to ensure the information supplied to TRAVEL GUIDE by the Service Providers is correct and up to date, you agree that TRAVEL GUIDE is not liable for the accuracy of such information. Many of the services which made up your travel booking are provided by Service Providers. Service Providers provide these services in accordance with their own terms and conditions. Some of these terms and conditions may limit or exclude the supplier’s liability to you. TRAVEL GUIDE accepts no responsibility for information supplied to us by third parties including the Service Providers. TRAVEL GUIDE recommends that you confirm all information contained on or linked from our Website with the Service Providers. The details of the prices, packages, tours, flights and other information displayed on the Website are subject to change without notice. The travel products and services described on the Website are subject to availability. It should be noted that all documents issued to travelers are non- transferable. Such documents may include but are not limited to, visas, airline tickets, hotel vouchers, tour vouchers, or any other document used to confirm an arrangement with a Service Provider. Such documents may also be subject to conditions such as, but not limited to, being non-refundable, non-date-changeable and subject to cancellation or amendment fees. It is your responsibility to familiarize yourself with these conditions. If for any reason, any Service Provider is unable to provide the services for which you have contracted, your remedy lies with that Service Provider, and not against TRAVEL GUIDE. In the event TRAVEL GUIDE received payment by credit card, you agree that you will not seek to chargeback or recover your payment or any other losses from TRAVEL GUIDE. Unless otherwise expressly agreed to by TRAVEL GUIDE in writing, you are responsible for obtaining all passports, visa and health information required. As a condition of your use of this Website, you warrant that (i) you are at least 18 years of age; (ii) you possess the legal authority to create a binding legal obligation on behalf of yourself and any other travelers you have included in your booking; (iii) you will use this Website in accordance with this Agreement; (iv) you will only use this Website to make legitimate reservations for you or for another person for whom you are legally authorized to act; (v) you will inform such other persons about the terms and conditions that apply to the reservations you have made on their behalf, including all rules and restrictions applicable thereto; (vi) all information supplied by you on this Website is true, accurate, current and complete, and (vii) if you have a TRAVEL GUIDE account, you will safeguard your account information and will supervise and be completely responsible for any use of your account by you and anyone other than you. We retain the right at our sole discretion to deny access to anyone to this Website and the services we offer, at any time and for any reason, including, but not limited to, for violation of this Agreement. TRAVEL GUIDE, in its sole discretion, may, at any time and without advance notice or liability, terminate or restrict your access to all or any component of our Website, even if access continues to be allowed to others. Upon such termination or suspension, you must immediately discontinue use of the Website, and destroy any copy you have made of any portion of the Website. Accessing the Website after such termination, suspension, or discontinuation shall constitute an act of trespass. TRAVEL GUIDE shall not be responsible to you to such suspension or termination. TRAVEL GUIDE may also, at any time, change or impose fees for certain services, or establish or change general practices and limits concerning certain services. TRAVEL GUIDE does not warrant or represent that the content of the TRAVEL GUIDE Website or promotional material is accurate, up-to-date or complete, nor that it does not infringe the rights of others. TRAVEL GUIDE is providing the Website, the promotional material and its contents on an “as is” basis. TRAVEL GUIDE makes no representations or warranties of any kind with respect to the Website, the promotional material, its contents or any of the products or services supplied by TRAVEL GUIDE. To the maximum extent permitted by law, TRAVEL GUIDE disclaims all implied representations and warranties including, without limitation, implied warranties that TRAVEL GUIDE products and services offered will be of merchantable quality, fit for any purpose or will comply with any descriptions on the TRAVEL GUIDE Website or promotional material. To the extent permitted by law, you release TRAVEL GUIDE from all liability, cost, damages, claims and expenses (including direct, indirect, special and consequential loss or damage whether in negligence or otherwise) arising out of the supply or failure to supply or use or non-use of the third party products or services. TRAVEL GUIDE does not represent or warrant that this Website, the server that makes it available or any TRAVEL GUIDE products or services supplied through this Website will be free of errors, viruses or defects. Your access and use of this Website is subject to factors beyond TRAVEL GUIDE control. TRAVEL GUIDE does not warrant that this Website or the products and services offered via this Website will meet your requirements or that the service will be uninterrupted or timely. TRAVEL GUIDE will use our best endeavors to make this Website secure and have implemented technology for this purpose. However, because of the nature of the internet, TRAVEL GUIDE does not warrant that this Website will be secure. To the maximum extent permitted by law, neither TRAVEL GUIDE nor any of our officers, employees, shareholders or other representatives will be liable in damages or otherwise in connection with your use of or inability to access this Website or the purchase and use of any products and services supplied via this Website or any breach of any warranties that may be implied by law. This limitation of liability applies to all damages of any kind, including compensatory, direct, indirect or consequential damages, loss of data, income or profit, loss of or damage to property, personal injury and claims of third parties. In the event that the TRAVEL GUIDE Website fails to operate or causes you loss or damage, your sole remedy is the refund of any money that you paid to TRAVEL GUIDE to us e this Website. If applicable, hotel ratings stated on the TRAVEL GUIDE Website or promotional material (without limitation includes photographs, list of hotel amenities, descriptions of property, etc.) are provided by the respective Service Providers. These hotel ratings are general guidelines and TRAVEL GUIDE cannot guarantee their accuracy. The promotional material is to be used as a general guide and the ratings and hotel information may be amended periodically by the respective Service Providers to keep current. Please be advised that during the peak Hajj season the Service Providers accommodate a large number of pilgrims and consequently the quality of service indicated by their respective ratings may suffer. All Service Providers are independent contractors, not TRAVEL GUIDE affiliates or agents. TRAVEL GUIDE is not liable for the actions, omissions, errors, representations, warranties, negligence, breach of contract, personal injuries, death, property damage, or any other damages or expenses resulting from Service Providers. TRAVEL GUIDE has no liability and will not refund due to delay, cancellation, overbooking, strike, force majeure, terrorism, and any other causes that are beyond TRAVEL GUIDE’s direct control or from any loss or damage resulting from improper passport, visas or other documents. TRAVEL GUIDE has no control and is not responsible for any additional expenses, delays, omissions, re-routing, or acts of interference by any government or legal authorities. TRAVEL GUIDE is not responsible for any traveler missing any part of the program due to no fault of TRAVEL GUIDE, and in such event, the traveler shall be responsible for any additional expenses incurred for the traveler to rejoin the tour. TRAVEL GUIDE will not make any changes after departure and will not redeem any part of the payment for any services rendered unutilized. TRAVEL GUIDE is not responsible for any traveler(s) missing any part of the program due to no fault of TRAVEL GUIDE, and in such event, the traveler(s) shall be responsible for any additional expenses incurred for the traveler(s) to rejoin the tour. TRAVEL GUIDE will not make any changes after departure and will not redeem any part of the payment for any services rendered unutilized. For a nominal charge, TRAVEL GUIDE will use DHL, FedEx or UPS to return your documents unless you send TRAVEL Guide pre-paid completed label for the courier of your choice excluding CANADA POST, to use for the return of your documents. TRAVEL GUIDE is not responsible for any delays, loss or damages resulting from the return of your documents by DHL, FedEx, UPS, or any other courier services. Please be aware that during your participation in packages operated by TRAVEL GUIDE, certain risks and dangers may arise beyond our control, including but not limited to: the hazards of traveling in undeveloped areas; travel by boat, train, automobile, aircraft, or other means of transportation; the forces of nature; political unrest; acts of lawlessness or terrorism; and accident or illness in remote regions without means of rapid evacuation or medical facilities. TRAVEL GUIDE will not have liability regarding provision of medical care or the adequacy of any care that may be rendered. While TRAVEL GUIDE will use its best efforts to ensure the adequate measures are taken, by agreeing to participate in a package and/or optional excursions you agree that you will hold TRAVEL GUIDE harmless regarding any provision of medical care or the adequacy of any care rendered. Many of the problems for which TRAVEL GUIDE cannot be held responsible for can be insured against. TRAVEL GUIDE highly recommends that you purchase third party insurance to provide adequate cover for medical expenses, personal accident, loss of baggage and curtailment or cancellation of trip. Individuals are responsible to finance on the spot medical treatment and other contingencies, and then to reclaim this from their own insurance, if covered. You will be required to provide documentation to the insurance company to facilitate a claim. Please note that there are exclusions to coverage of insurance. Insurance has to be purchased and paid for in full as soon as the booking is made to become effective. To the extent permitted by law, you release TRAVEL GUIDE from all liability, cost, damages, claims and expenses (including direct, indirect, special and consequential loss or damage whether in negligence or otherwise) arising out of any loss of baggage. TRAVEL GUIDE accepts cheques, money orders, Visa, MasterCard, and Cash. Your payment is not deemed made until it is received by TRAVEL GUIDE. Please be advised that a 4% surcharge applies to all payments made by credit card. Deposit Amount : 25% of full package price due 150 days prior to departure. Second Installment Amount : Next 25% of full package price due 120 days prior to departure. Balance : 50% of full package price due 90 days prior to departure. Your booking is not confirmed until the Deposit is received by TRAVEL GUIDE and you receive written confirmation of your booking from TRAVEL GUIDE. Your reservation may be automatically canceled if payments are not received by TRAVEL GUIDE by the applicable deadlines above. Special conditions may apply to the prices set out on the Website. To determine such conditions, you must contact TRAVEL GUIDE or the relevant Service Provider. Please review and verify your booking invoice thoroughly and contact your travel agent or TRAVEL GUIDE immediately if your invoice appears to be incorrect or incomplete, as it may not be possible to make changes later. Please be advised that once your documents have been processed for visa by our office, there will be NO refunds available for the package(s) you have purchased. 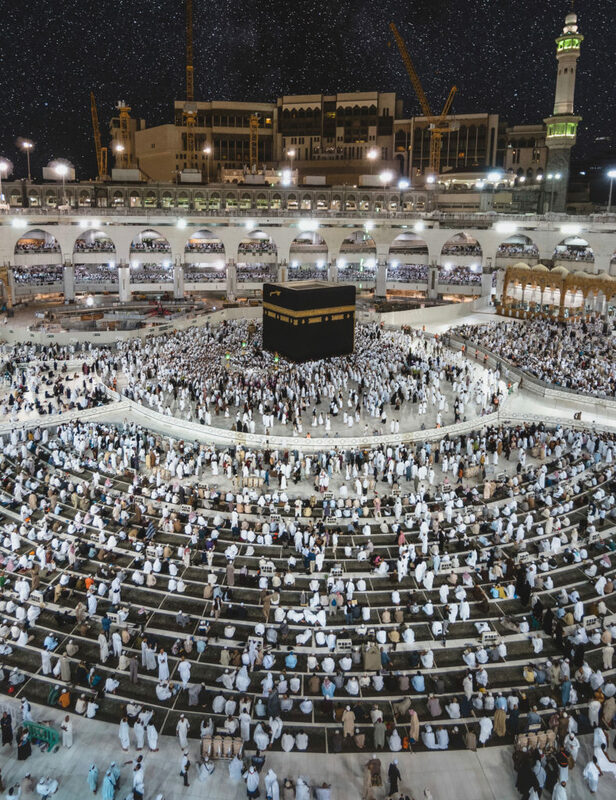 All fees imposed by the Kingdom of Saudi Arabia, including Hajj and Umrah fees or related to the ritual animal sacrifice, are separately charged and not included in any package or programs. You must report to TRAVEL GUIDE in writing any disability requiring special attention while traveling at the time the reservation is made. TRAVEL GUIDE will make reasonable attempts to accommodate the special needs of disabled travelers but is not responsible in the event it is unable to do so nor is it responsible for any denial of services by Service Providers. TRAVEL GUIDE regrets that TRAVEL GUIDE cannot provide individual assistance to a traveler for walking, dining, getting on and off buses and other vehicles, or other personal needs. A qualified and physically able companion must accompany travelers who need such assistance and must assume full responsibility for their well-being; if such a companion is not available for the traveler, TRAVEL GUIDE may, in its discretion, cancel the reservation and return the full deposit of the traveler. Travelers who are less than 18 years old on the departure date must be accompanied by an adult throughout the duration of the trip. For any special requirements regarding airline tickets for children, contact your airline directly. If a child will be traveling with adults other than the parents or with only one parent, it is recommended that a notarized letter be written by the parents or non-traveling parent granting authorization to travel, including the dates of travel. TRAVEL GUIDE suggests that you also contact the appropriate consulate and airlines because they may have additional requirements or recommendations. To the extent allowed by applicable law, you agree that you will bring any claim or cause of action arising from or relating to the Agreement within two (2) years from the date on which such claim or action arose or accrued or such claim or cause of action will be irrevocably waived. In any case, TRAVEL GUIDE shall not be liable for other than compensatory damages. Additionally, you hereby waive any right to punitive damages. All parties agree to irrevocably waive their respective rights to a jury trial of any cause of action, claim, counterclaim, or cross-complaint in any action or proceeding and/or hearing brought by either party against the other on any matter whatsoever arising out of these Terms & Conditions or any agreement between you and TRAVEL GUIDE. Headings are for reference purposes only. Notwithstanding any other provision contained herein, if TRAVEL GUIDE does not act in relation to a breach by you or others of these Terms & Conditions, this does not waive TRAVEL GUIDE’s right to act with respect to subsequent or similar breaches. This Agreement may be supplemented, amended, or modified only by the mutual agreement of the parties. No supplement, amendment, or modification of this Agreement shall be binding unless it is in writing and signed by all parties. No person, other than an authorized representative of TRAVEL GUIDE by a document in writing, is authorized to vary, add, or waive any term or condition set forth in the preceding provisions. This Agreement shall be governed by the laws of the Province of Ontario, without regard to the conflicts of laws provisions therein. This Agreement (and any other terms and conditions referenced herein) constitutes the entire agreement between you and TRAVEL GUIDE and it supersedes all prior or contemporaneous communications and proposals, whether electronic, oral, or written, between the customer and TRAVEL GUIDE. A printed version of this Agreement and of any notice given in electronic form shall be admissible in judicial or administrative proceedings based upon or relating to this Agreement to the same extent and subject to the same conditions as other business documents and records originally generated and maintained in printed form.